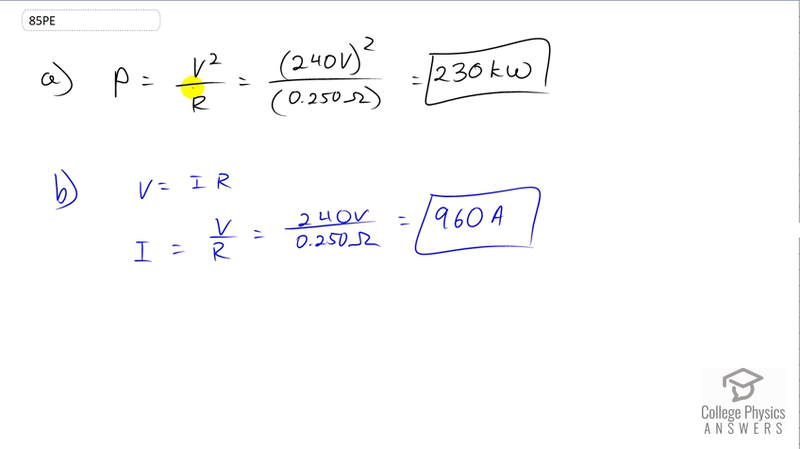 (a) How much power is dissipated in a short circuit of 240-V AC through a resistance of $0.250 \Omega$ ? (b) What current flows? This is College Physics Answers with Shaun Dychko. The power dissipated in the short circuit of 240 volts that has a resistance of 0.25 ohms is the voltage squared divided by the resistance. That's 240 squared over 0.25 ohms which is 230 kilowatts. The current that flows we can figure out from <>V equals I R, Ohm's Law, and divide both sides by R and we get the current is the voltage divided by resistance, 240 volts divided by 0.25 ohms, which is 960 amps.